Tons of settings allows you to change every pixel in the tables including set of columns, set of coins to display, fiat currency, coins per page, search coins box, values colors and badges, values formatting, chart time period, chart coin property, etc. No need to reload the page every time you want to see the most recent data, green/red flashes and badges are updated automatically with a new data. Click on any coin in the table to see the historical changes on the interactive chart. 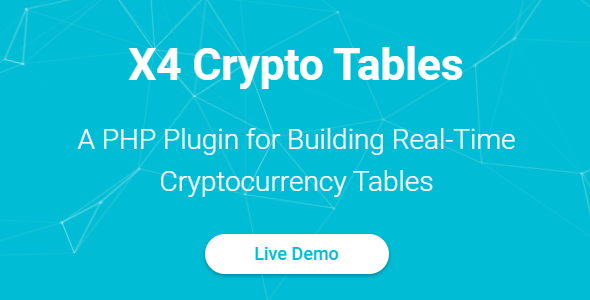 Review the examples to see all the power of X4 Crypto Tables and a large set of different options available for customization. The tables are fully responsive and mobile ready, work perfect on desktops, tablet and mobile devices, including full screen mode. Highly Customizable. Full-featured tables, tons of settings allows you to change every pixel in the tables. Real-Time Data. No need to reload the page every time you want to see the most recent information. Select Fiat Currency. A large set of fiat currencies to compare with cryptocurrencies, such as USD, EUR, GBP etc. Flashes & Badges. Green & Red flashes and badges with a new data values are updated automatically every second. 1000+ Crypto Coins. A large set of cryptocurrencies to select, adding more crypto coins every week automatically. Excluding Coins. Ability to display a list of all cryptocurrencies except a fixed array of excluded coins. Fixed Set Of Coins. Ability to display only a fixed list of cryptocurrencies instead of whole 1000+ list of coins. Historical Charts. Click on any coin in the table to see the historical changes on the interactive chart. Search For Coins. Use the search box to find needed coins, for example display a list of all Ethereum coins. Customize Columns. Tons of column customization options such as titls, aligning, sorting, template, etc. Customize Colors. Select the colors of any control in the table, including flashes colors, badges colors, etc. Columns Hide Order. Select the order of columns to hide if there is not enough space, e.g. for tablet & mobile devices. Localizations. Ability to localize all the labels in the table including column titles, all controls labels. Values Template. Use the value template string line to customize the output of coin names and values. Values Formatting. Use value formatting options such as rounding factor, thousands separator and precision.